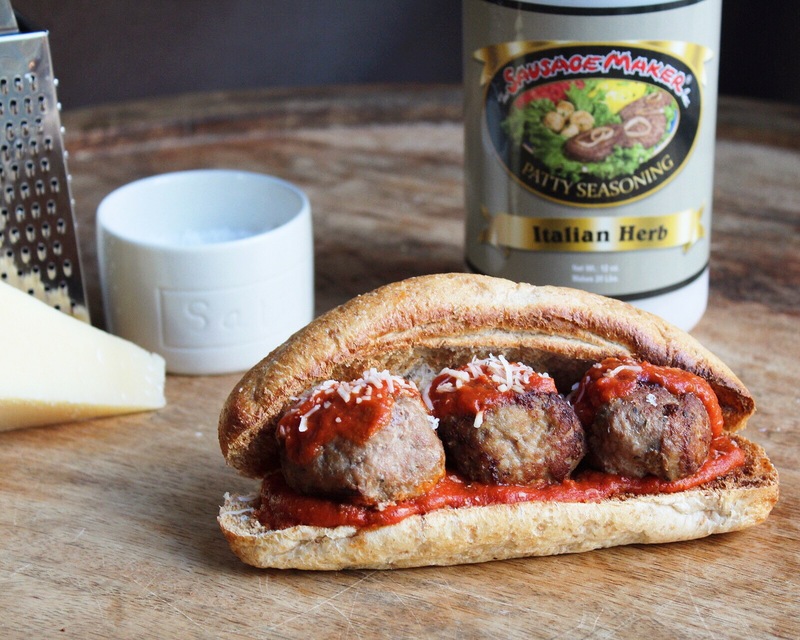 Add the right amount of seasoning to turkey meatballs to make a perfect sub sandwich at home. All you need to do is combine turkey, garlic, Italian Herb Seasoning from The Sausage Maker, and salt to make flavorful meatballs packed with protein. Add any leftovers to pasta or eat on their own dipped in marinara sauce. In a large bowl add ground turkey, garlic, seasoning, and salt. With clean hands, mix ingredients together well. Form the mixture into balls with your hands and set aside. In a large skillet or saucepan heat enough olive oil to coat the bottom of your pan. Add meatballs to the pan and cook each side for a few minutes until browned and no longer pink inside. Once done, remove from heat. Slice the baguettes open and layer marinara sauce, meatballs, more marinara, and cheeses. Place on a baking sheet and heat in the oven for 5-10 minutes, or until cheese is melted.